These pages are dedicated to my software projects. I taught myself how to program in the late 1970s using programmable calculators (Texas Instruments SR-56 and TI-59), the Radio Shack TRS-80, and my own home-built microcomputers. I progressed from calculator languages to BASIC, Z80 assembler, 8086 assembler, 68000 assembler, Pascal, C, and C++. Today I program using a PC, Linux, and gcc. I wrote all of the programs on these pages as a hobby. The programs may be divided into four categories: Z80 software, 68000 software, Windows software, and Linux software. These programs were written between 1978 and 1984 for my first home-built microcomputer, the Genius 1. Since the Genius 1 did not come with any software, out of necessity I developed all types of software including an operating system, high-level language, and applications. Earlier programs were written in Z80 machine language. Later programs were written in Z80 assembly language and BASIC. I learned a lot about programming during this time. Although the Genius 1 is long gone, its software continues to run under Gem, the Genius computer emulator that I developed for the PC. Gem runs my Z80 software 70 times faster than before! These programs were written between 1984 and 1995 for my second home-built microcomputer, the Genius 2. A dual-processor machine, this computer could run the Z80 software written for its predecessor. In addition, I developed a new operating system, high-level language, and applications for the much more powerful 68000. Only a small fraction of the Genius 2's software was written in assembly language. The majority was written in a high-level language that I invented, the E language. Today the Genius 2 computer still runs my 68000 software. 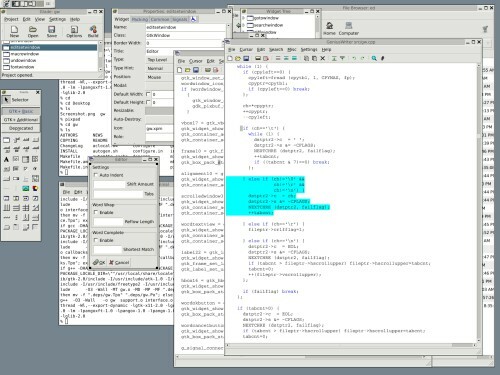 In addition, E language software runs on the PC using the PC version of the compiler and run-time library. A 3 GHz Pentium 4 runs this software 1,000 times faster than an 8 MHz 68000! By 1995, I had accumulated several hundred programs. However, my home-built computers had become dinosaurs. Thus, I undertook a new effort to port my software to the PC using the C language and Microsoft's then-new Win32 API. Simple programs were run under the emulator or were recompiled. Such programs retain all of the features and limitations of the originals. More sophisticated programs were rewritten in the C language and given graphical user interfaces and additional features. Entirely new programs were also created. I used Unix a lot in college and at work, but Unix was always too expensive for home use. Today, there is a Unix-like operating system available at little or no cost: Linux. In December 2004, I installed Slackware Linux 10.0 on my home PCs and started porting my software to Linux using GTK+. Linux is a very good software development environment. The software museum chronicles my software projects over the years. Click on the menu at the left to take a trip back in time.